Organica returns to Enchantment on February 9, running thru March 4th, with several new products as well as a few existing complimentary products as well! 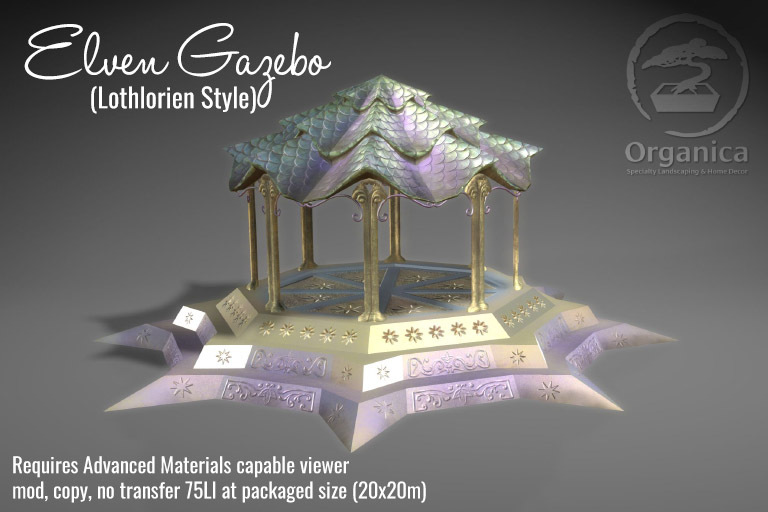 The theme this round is Lord of the Rings, so I’ve chosen to create my own interpretation of a couple of Elven gazebos as well as Galadriel’s Mirror – drawing in lore both from the main books as well as the Silmarillion. 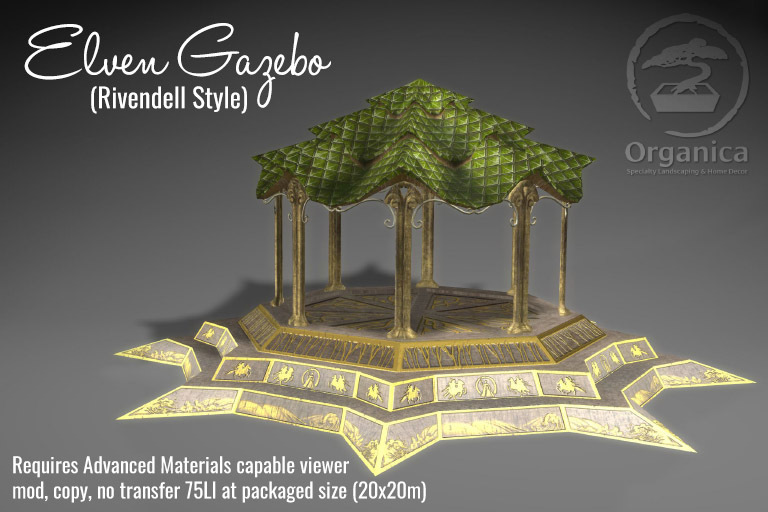 The Gazebos are 75LI at packaged size (20x20m) and mod/copy/no transfer. 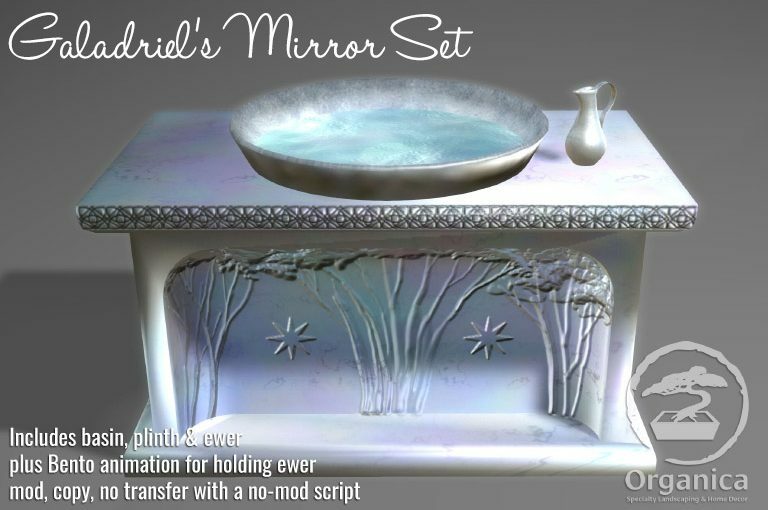 The Mirror & Plinth are a single 1 LI object, as is the accompanying silver ewer, which can be worn or simply rezzed where you wish. Mod, copy, no transfer. Additionally, the Elven Bridges and Weeping Willows will also be available at Enchantment. Drop by my booth here! All the new items will be exclusively at Enchantment for the duration of the event, after which they’ll make their way back to the main shop in March. In the mean time, we’re gearing up to work on a number of spring projects moving forward. What kind of tree, plant or landscaping items do you feel are still missing? Leave your feedback here or IM me (Aki Shichiroji) in-world directly! Previous Previous post: Animesh Hits Organica – Weeping Willow Trees Now Available! Next Next post: Looking Forward to Spring – New Cherry Trees are here!